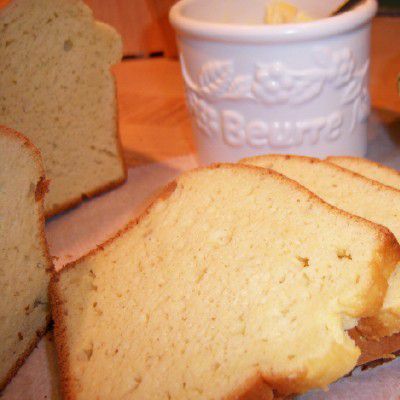 This high protein gluten-free bread recipe is also dairy-, soy- and bean-free. It makes very good morning toast and French toast. This recipe was adapted from a recipe which appears in Gluten-Free Baking with The Culinary Institute of America by Richard J. Coppedge Jr., C.M.B., called "Egg Bread." Note: Yeast bread made with high protein flours absorb liquids more easily than bread made with gluten-free white rice flour, tapioca starch, and potato starch. I carefully formulated the recipe for High Protein GF Flour Blend for this bread recipe. It's unusual in that it contains egg white protein powder, amaranth flour, and sorghum flour along with more usual gluten-free flour blends -- white rice flour, brown rice flour, and tapioca starch. I don't recommend substituting rice/starch gluten-free flour blends when making this recipe. They do not contain enough protein. For example, it would be like using traditional cake flour in a recipe for French bread which requires bread flour which is higher in protein than cake flour. Bread recipes are the most exacting of gluten-free recipes. One substitute here and one there can completely change how the batter absorbs liquids, how it rises and ultimately how long and at what temperature it bakes. Combine dry ingredients in a large mixing bowl. Use a large whisk to thoroughly blend. Lightly whisk egg yokes. Add olive oil to yolks and add to dry ingredients. Slowly add carbonated water to the bowl and mix until blended. Using an electric hand or stand mixer, beat bread batter on high for 4 minutes. Scrape batter down with a spatula and cover bowl with a damp towel or plastic wrap. Place in a warm location to rise for approximately 45 minutes. Stir down the batter and pour into prepared loaf pan. Dip a flexible spatula in water and use it to press the batter evenly into pan and smooth the top of the loaf. Set the loaf pan, uncovered in a warm, draft-free location to rise. When the batter is about 1 inch below the top rim of the bread pan, place it in preheated oven. Bake bread for 50 minutes or until internal temperature reads 200° on an instant read thermometer. Remove bread from loaf pan and cool on a rack before slicing. What's In Your Favorite Gluten-Free Baking Mix? Is Udi's Gluten-Free Multigrain Bread Worth the Price?